In case you happen to be one of the few Nintendo Switch owners who doesn’t own Splatoon 2, Nintendo is offering a free demo. Today the company announced that it would be offering the game as a Special Demo that you can download from the eShop as we speak. The demo itself will run from March 19th at 7am PT until March 25th at the same time. And according to the company’s own info on the event, you’ll pretty much have access to everything the game has to offer, as well as a discount on the game if you choose to purchase. 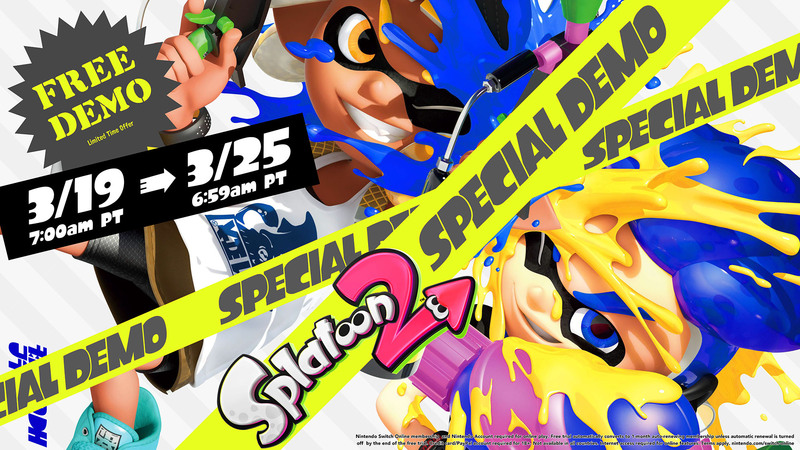 The Splatoon 2 Special Demo is available starting today in Nintendo eShop for Nintendo Switch. After downloading it, you’ll receive an email with a Nintendo eShop code to activate a seven-day free trial*** for Nintendo Switch Online. You can use the code even if you’ve had a previous free trial. If the free demo makes you happy as a clam and you want to buy the full Splatoon 2game, you’ll get a 20 percent discount if you buy it via Nintendo eShop during the demo period. As an extra bonus, you’ll even be able to transfer your demo progress over. These demos don’t come around too often from Nintendo and rarely do they include a discount. So if you’ve ever wanted to try it out for a minute and see if it’s worth your cash to purchase, this would be the time.